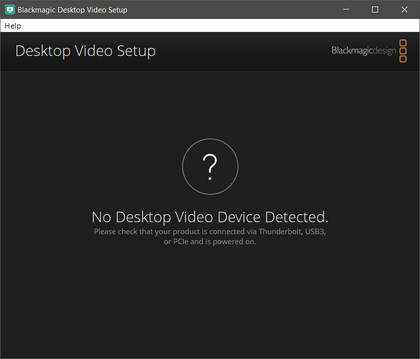 Device responds and works in Resolve 14.2, and Avid MC 8.9.x but is unavailable in Blackmagic's Desktop Video Setup application. This is a problem since I can't make output conversions from HD to SD from Avid, and I cannot switch between my audio sources on the Intensity. 10.9.5 still works, but is missing the bug fixes and improvements made in 10.9.7 and 10.9.9. Last edited by Christopher Osborn on Sat Jan 20, 2018 1:11 am, edited 1 time in total. Same problem, same workaround. 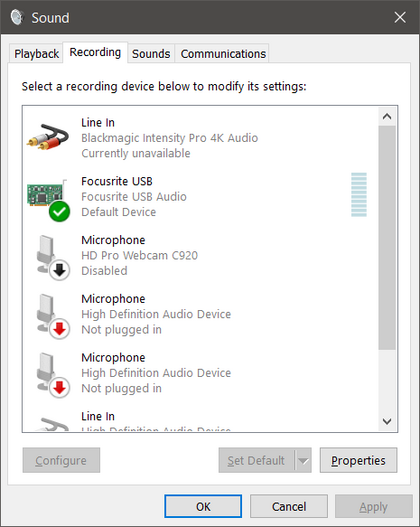 The Pro 4k is clearly recognized by my computer but there seems to be some sort of software hiccup. Even back on 10.9.5 it's listed as "currently unavailable" in this window, though it functions as intended. <Bump> Updated first post to include continuing failure of 10.9.10 with the Intensity Pro 4K card. This is a user forum guys, if you're hoping for a BMD fix you'll need report it via BMDs webpages. Andrew Martin wrote: This is a user forum guys, if you're hoping for a BMD fix you'll need report it via BMDs webpages. Yep. But reporting to BMD as a Technical Support issue doesn't allow anyone else to see what is going on, and at least for me, I prefer to see what other users are up to. I had the same issue and I figured out that it wasn't working for me because I disabled all of the Black Magic software in the startup section of task manager. Double check to make sure that it's all enabled. Hey davbay1 I have to say THANK YOU VERY MUCH for taking the time to put the answer to my headaches! This was driving me crazy because I have the same problem and your solution work flawless. You make my day! Again Thanks! thanks a million for that hint...solved my problem too ! I'll write BM about it, must happen often, they should mention that in the manual. Same here. Tried different PCI slots. Tried Decklink 4k, Decklink monitor, Intensity 4. All have the same problem. The driver is loaded. It shows up in Resolve. 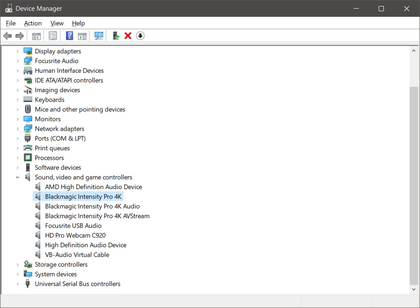 Does not show in Desktop Video device or Media Express or Premiere. Capture in Resolve doesn't work. Rolled back Desktop 10.11 reinstalled, no change. It worked before I changed cards, my best guess at this point is recent Windows updates. Autostart was deactivated for them BM items. davbay1, thank you so much! This issue has been plaguing me for ages and I came across this post which fixed my problem! This worked well on me. Thanks bro.